Tools needed Credit card or squegee, masking tape, exacto knife or scissors. Be Clean! Make sure your intended surface is clean and free of dust. 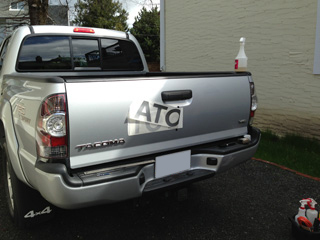 Wipe down with a damp cloth and then dry any moisture or residue that may prevent your decal from sticking. Use soap and water or rubbing alcohol. Be Prepared! Plan your design - If there are multiple designs on a sheet cut them out first and then pin or tape them in place while you decide. Decals are not re-usable. They go up and they come down, but only once, so be sure before you stick. Be Patient! Tape you project in place and when ready place a piece of tape from the top to the bottom to make a hinge. Then you're ready to peel the graphic from the white backing. It is very important to do this carefully, so take your time. We recommend slowly pulling the taped layer (with the graphic) at 45 degrees, from corner to the hinge. Cut away the backing paper. Be Careful! Once the decal is off the backing it is extremely sticky, so hold it firmly at the edges so it won't fold in on itself. Using a credit card or squegee, firmly secure your decal in place. Use a sweeping motion from the center to the top, center to the bottom. Once it's down, carefully peel off the hinge and continue with the other side. Once it's down, carefully peel off the translucent tape layer at 45 degrees, corner to corner. If the Decal remains stuck to the tape, stop and secure it before peeling again. If you get any wrinkles from shipping use the back of your finger nail to squish them down and pop any bubbles with a pin and then push out the air with your finger nail! Be Happy! Discard the tape, take a step back and admire your work.